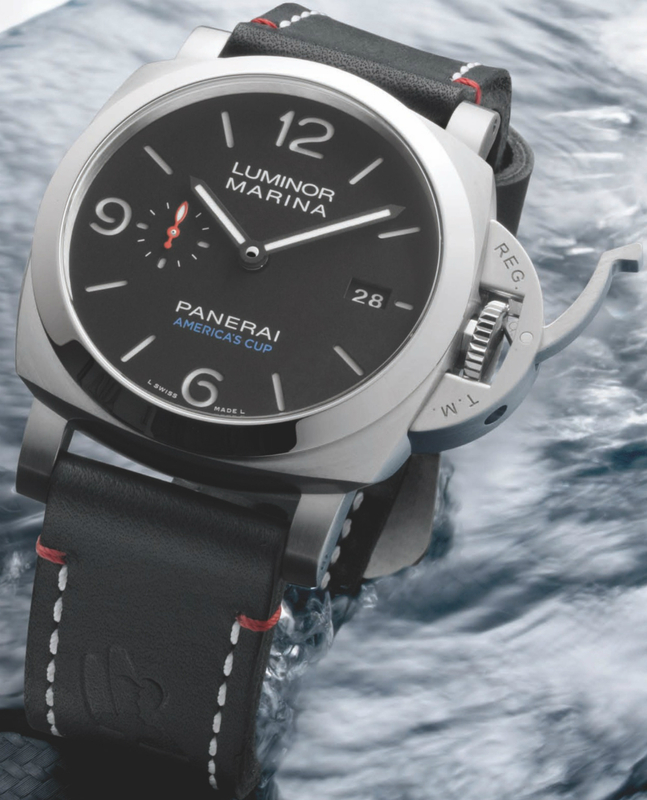 Panerai is synonymous with the sea. After all, the brand made its name producing maritime instruments for the Royal Italian Navy. 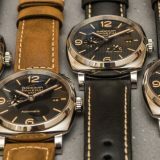 These days, Panerai no longer makes instruments for the military, but it stays true to its oceanic roots as a partner to various yacht clubs and regattas around the world. In fact, in 2006, Panerai even bought the vintage boat Eilean and took it upon themselves to have her restored to her former glory. 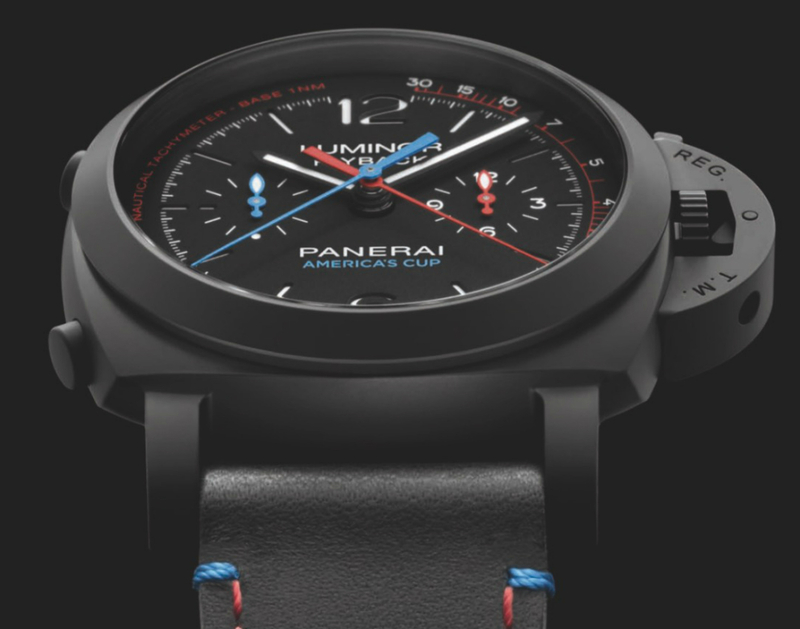 In addition, Panerai’s CEO, Angelo Bonati, is an avid sailor himself. 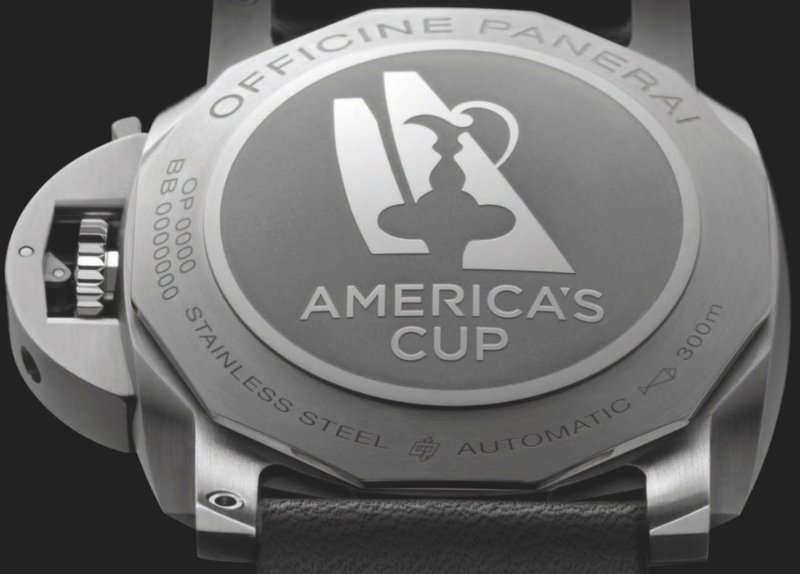 2017 is going to be a momentous year for Panerai as it will be the official partner for the 35th America’s Cup. The America’s Cup is not only one of the world’s oldest international sporting trophies, it is also arguably the most prestigious sailing competition. To mark the occasion, Panerai has just announced no fewer than five Special Edition watches, and here they are. For those who are not entirely familiar with the America’s Cup, it is a series of races between two sailing yachts. The Defender is the yacht that currently holds the cup, the current Defender being Oracle Team USA on behalf of the Golden Gate Yacht Club. Since 1983, the right to challenge to Defender is determined by another competition called the Louis Vuitton Cup. 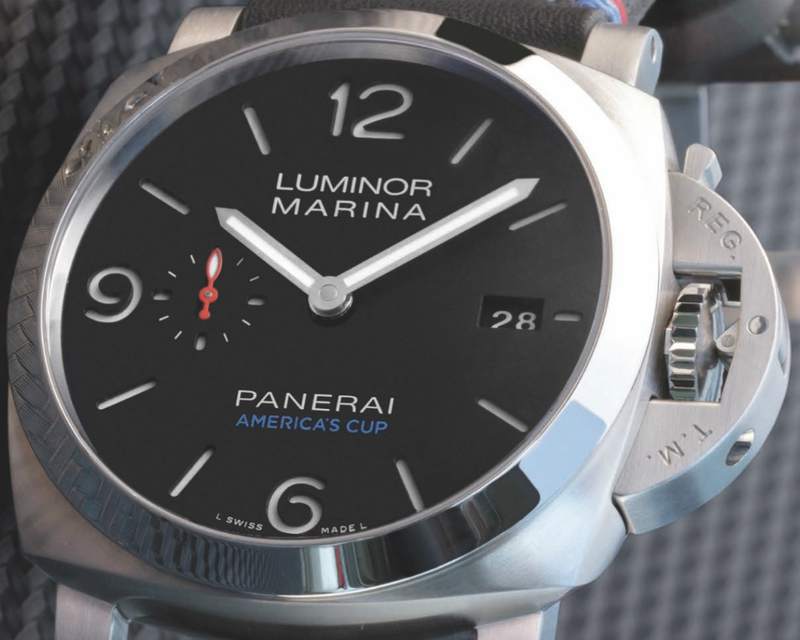 We begin with the Panerai Luminor Marina 1950 America’s Cup 3 Days Automatic Acciaio 44mm (PAM727), which is also the official watch of the 35th America’s Cup. Paneristis (Panerai enthusiasts) would immediately notice the resemblance to the Panerai Luminor Marina 1950 3 Days Automatic Acciaio 44mm (PAM1312 and PAM312). We reviewed a similar piece here, though on a steel bracelet. 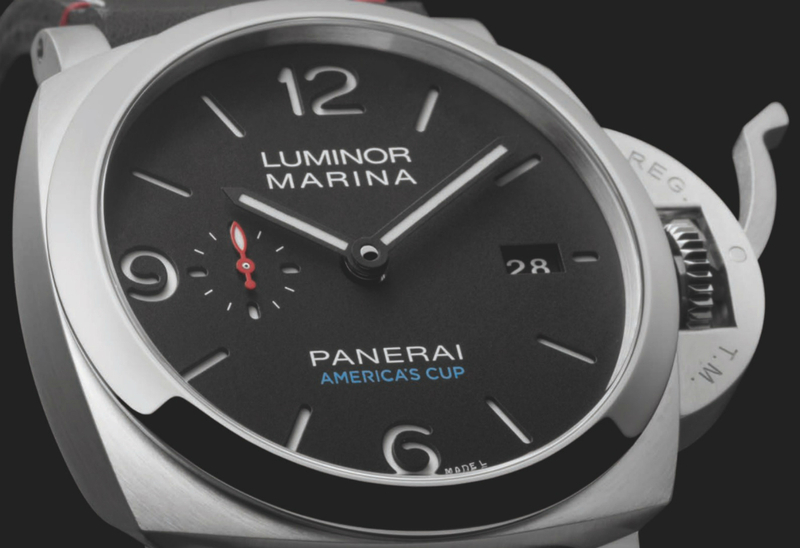 The Panerai Luminor Marina 1950 America’s Cup 3 Days Automatic Acciaio 44mm also shares the same 44mm stainless steel 1950 style Luminor case and the self-winding P.9010 movement with the Panerai Luminor Marina 1950 3 Days Automatic Acciaio 44mm. 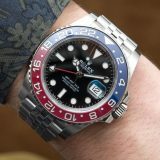 The key features that differentiate this Special Edition watch are the phrase “America’s Cup” printed in blue at 6 o’clock and the striking red seconds hand. 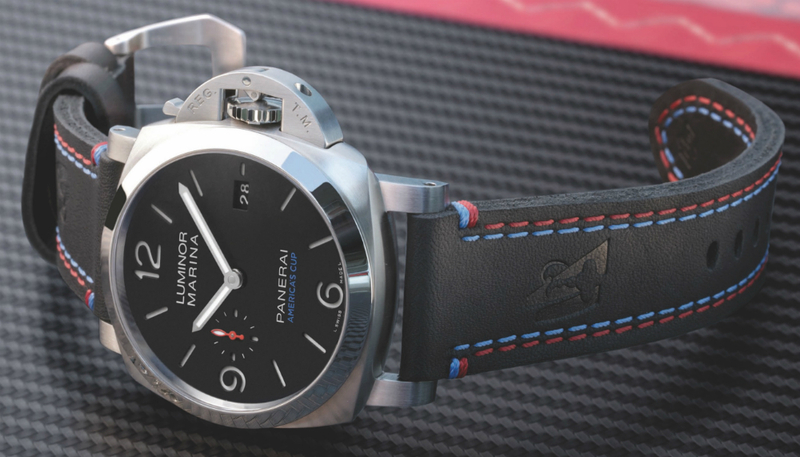 What is also unique to the Panerai Luminor Marina 1950 America’s Cup 3 Days Automatic Acciaio 44mm watch is the strap which is made out of natural untreated leather embossed with the logo of the America’s Cup, and is finished with contrasting red and blue stitching. Water resistance is a very adequate 300 meters. 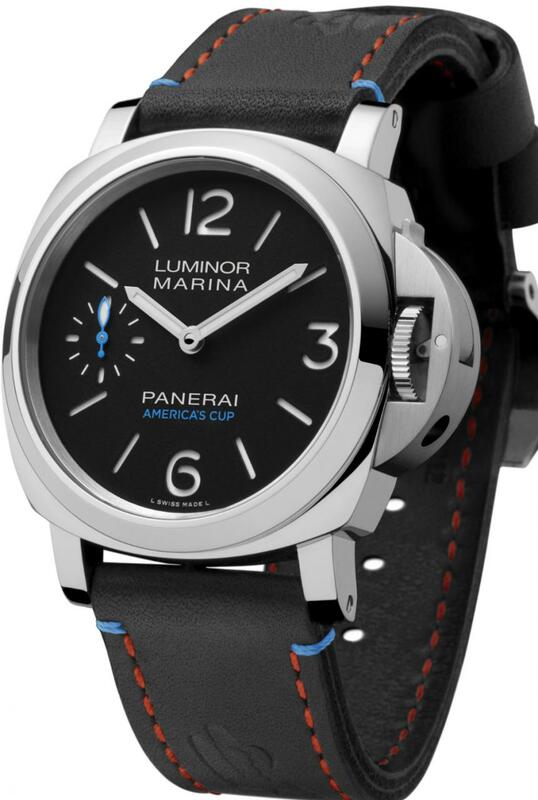 The Panerai Luminor Marina 1950 America’s Cup 3 Days Automatic Acciaio PAM 727 will have a price of US $8,100. 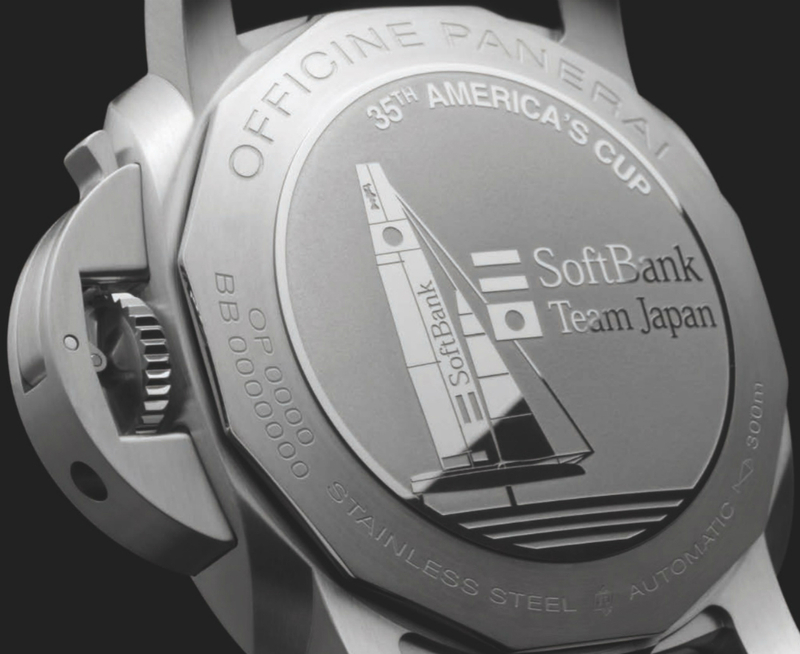 Panerai is also the official partner for Softbank Team Japan, who is one of teams that will be taking part in the Louis Vuitton Cup to determine the who will have the right to challenge Oracle Team USA. 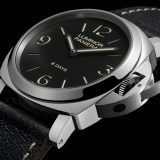 So it is fitting that this watch is the Panerai Luminor Marina 1950 Softbank Team Japan 3 Days Automatic Acciaio 44m (PAM732), created especially for Softbank Team Japan. Similar to the other watches, you’ll note small changes like white stitching on the strap that differentiate it. Based on the popular Panerai Luminor Marina 1950 3 Days Acciaio 44mm, the Panerai Luminor Marina 1950 Softbank Team Japan 3 Days Automatic Acciaio 44m differentiates itself from the standard model with the phrase “America’s Cup” in blue at 6 o’clock and its red running seconds hand. Again, inside beats the self-winding Panerai P.9010, which offers 3 days of power reserve. Water resistance is 300 meters. 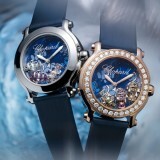 The big difference between the previous model and this one is the different engraved case back. In this watch, the case back has been engraved with the official logo of Softbank Team Japan. In addition, the strap, which is black leather, has contrast stitching in red and white, the official colors of Japan. Price for the Panerai Luminor Marina 1950 Softbank Team Japan 3 Days Automatic Acciaio PAM 732 US $8,100. 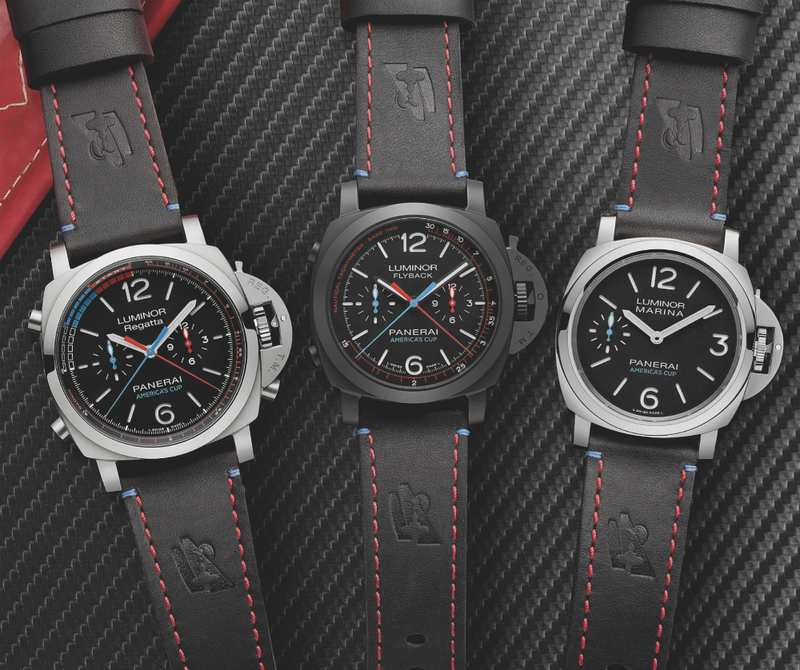 Next up, we have three watches specially created by Panerai for Oracle Team USA. 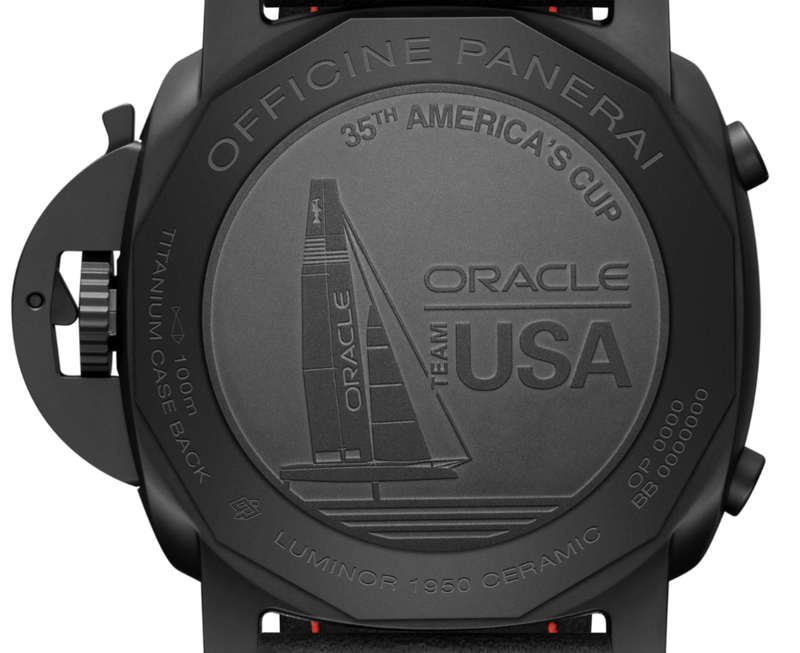 Panerai is also the official partner of Oracle Team USA, the Defender of the 35th America’s Cup. The first watch for Oracle Team USA is the Panerai Luminor 1950 Oracle Team USA 3 Days Chrono Flyback Automatic Ceramica 44mm (PAM725). This watch features a 44mm-wide Luminor 1950-style case made out of black ceramic, and features Panerai’s P.9100 calibre. 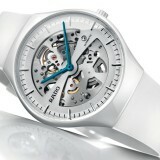 The P.9100 calibre has a flyback chronograph mechanism and features a column-wheel with vertical clutch construction. 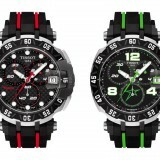 Water resistance is 100 meters, and power reserve is 3 days. The Panerai Luminor 1950 Oracle Team USA 3 Days Chrono Flyback Automatic Ceramica’s case back features an engraving of the logo of Oracle Team USA, and it also carries over the red and blue color scheme found in the aforementioned Panerai Luminor Marina 1950 America’s Cup 3 Days Automatic Acciaio 44mm watch. The chronograph minutes and seconds hands are positioned centrally to ensure utmost legibility, and the chronograph seconds hand is blue while the minutes hand is red. There are a further two sub-dials, one at 9 o’clock for the running seconds, which has a blue hand; and the other at 3 o’clock that records the elapsed hours, which has a red hand. The case back features an engraving of the logo of Oracle Team USA, and the strap is black untreated leather with contrasting red and blue stitching. 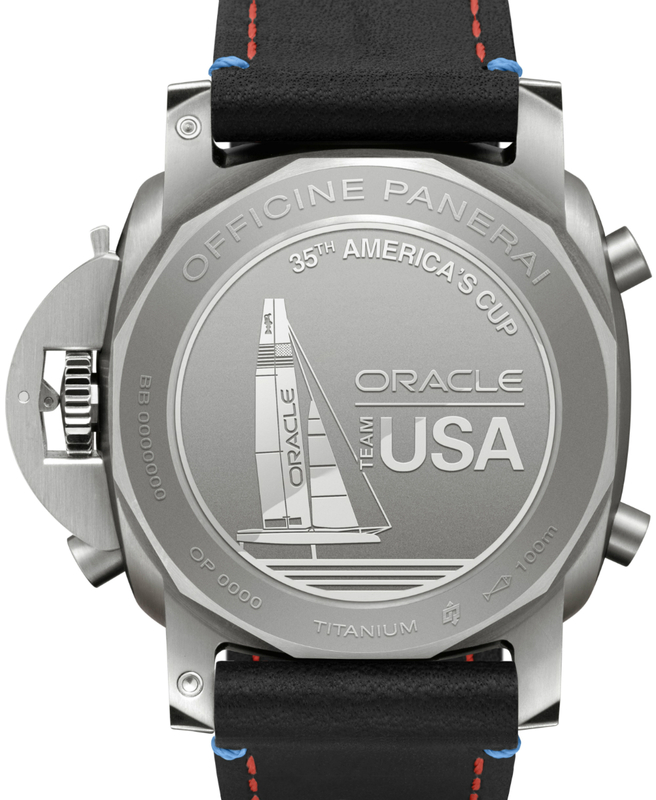 Price for the Panerai Luminor 1950 Oracle Team USA 3 Days Chrono Flyback Automatic Ceramica PAM 725 is US $15,300. The next watch is the Panerai Luminor 1950 Regatta Oracle Team USA 3 Days Chrono Flyback Automatic Titanio 47mm (PAM726). 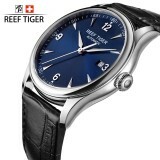 Again, the name tells you much of what you need to know about the watch. If not, you can read our coverage of the original model here. It comes in Panerai’s larger 47mm Luminor 1950 style case, constructed from titanium, and has a flyback chronograph fitted with a Regatta countdown mechanism. Water resistance is also 100 meters. The movement is the P.9100/R and the Regatta countdown mechanism can be activated by the pusher at 4 o’clock. Pressing on it causes the central chronograph minute hand to move back in one-minute jumps, allowing it to be set to the correct countdown position for the race. 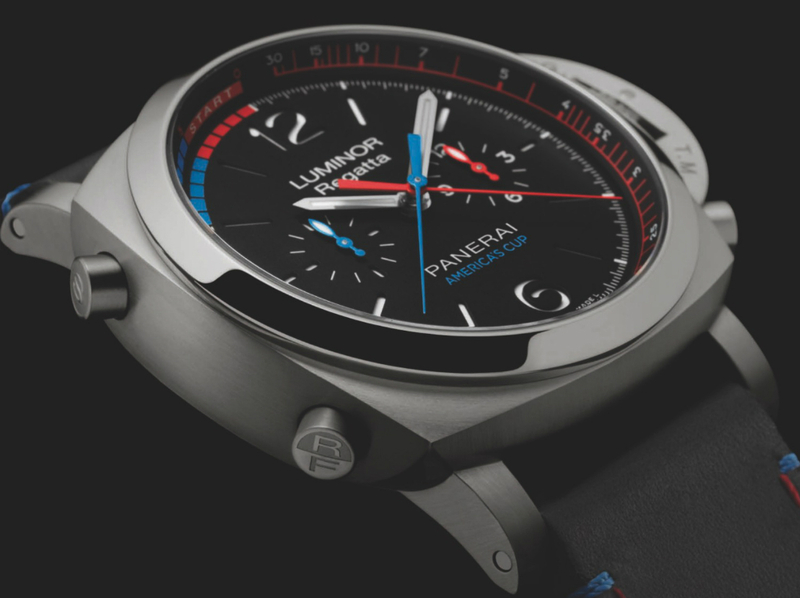 Like the other watches seen so far, the Panerai Luminor 1950 Regatta Oracle Team USA 3 Days Chrono Flyback Automatic Titanio 47mm has an attractive red and blue color scheme. To ensure legibility, the central chronograph seconds hand is rendered in blue while the central minutes hand is red. At 9 o’clock is a sub-dial for the running seconds, which has a blue hand; and at 3 o’clock we have the sub-dial recording the elapsed hours, and this has a red hand. Again, the strap is black untreated leather and features contrasting red and blue stitching. 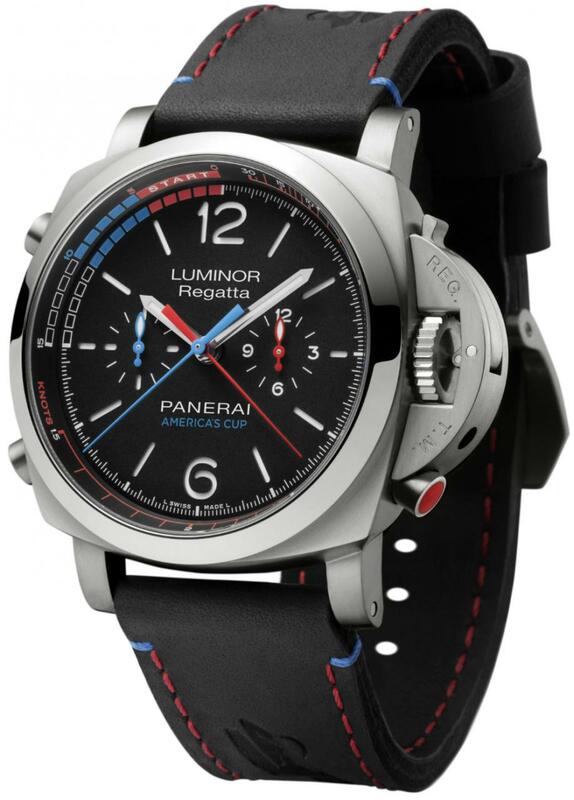 Price for the Panerai Luminor 1950 Regatta Oracle Team USA 3 Days Chrono Flyback Automatic Titanio is US $17,900. 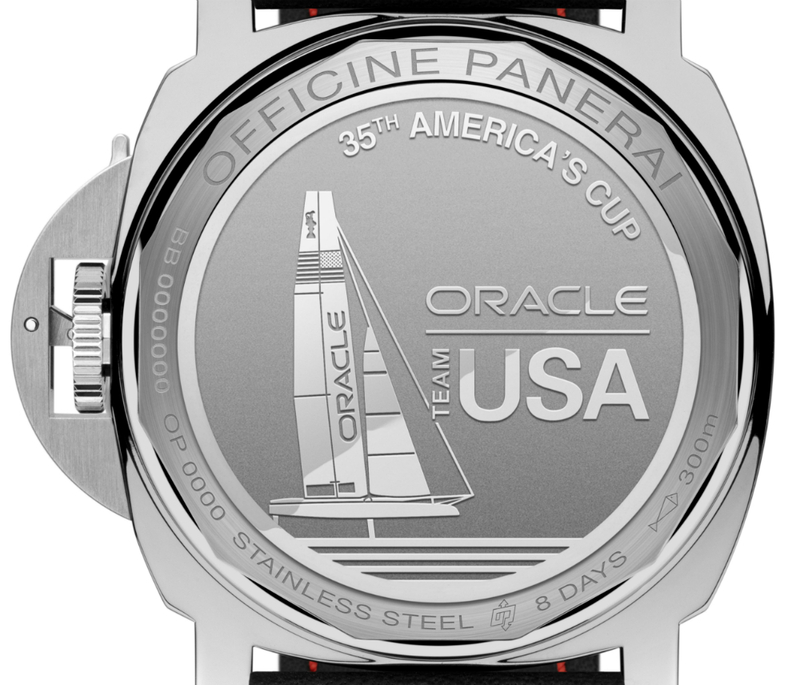 The last Oracle Team USA watch is the Panerai Luminor Marina Oracle Team USA 8 days Acciaio 44mm (PAM724), which is clearly based on Panerai’s extremely popular Luminor Marina 8 Days Acciaio (PAM510), but with some subtle changes. For example, there’s the phrase “America’s Cup” in blue at 6 o’clock, and the running seconds hand is also rendered in blue. Like the rest of the Oracle Team USA watches, the case back features the engraved team logo of Oracle Team USA. But unlike the other two Oracle Team USA watches, the Panerai Luminor Marina Oracle Team USA 8 days Acciaio 44mm has a water resistance of 300 meters. It is also the only watch in this series that is wound by hand. The movement inside is the P.5000, which features two barrels that offer a whopping 192 hours, or 8 days, of power reserve. 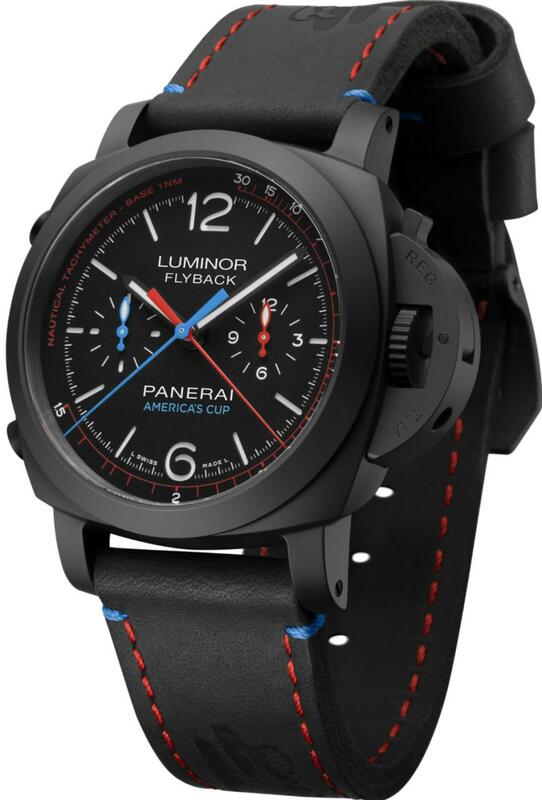 One of the more subtle America’s Cup models, the touches of blue on the dial look very cool in the press images, but I can’t wait to see real photos of the watch in action. 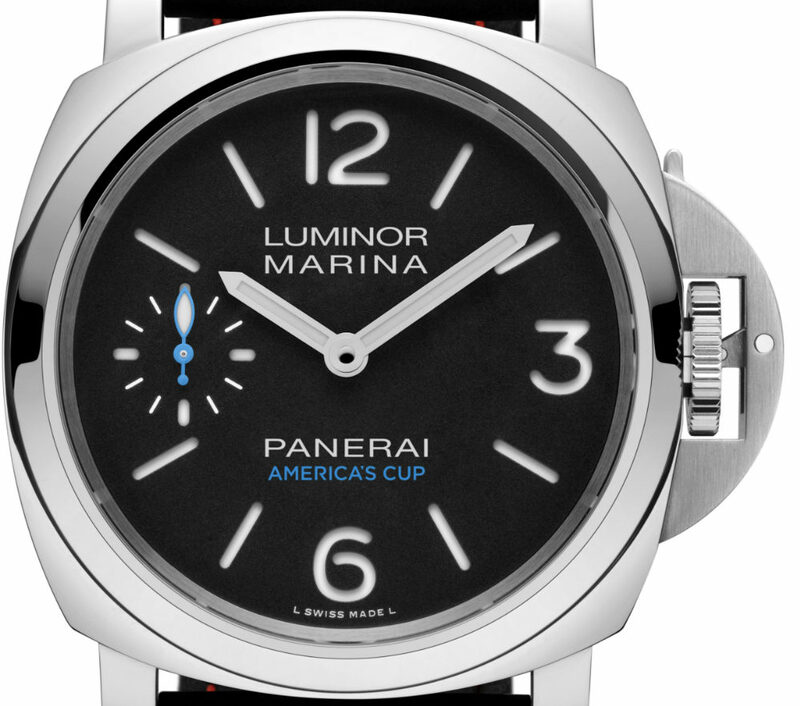 Price for the Panerai Luminor Marina ORACLE TEAM USA 8 Days Acciaio is US $7,100. Keep up with all our pre-, post-, and live SIHH 2017 coverage here and on your favorite social media channels with #SIHHABTW! Other innovations in materials and technology, however, are embraced for their capability to add value to prestige watches. 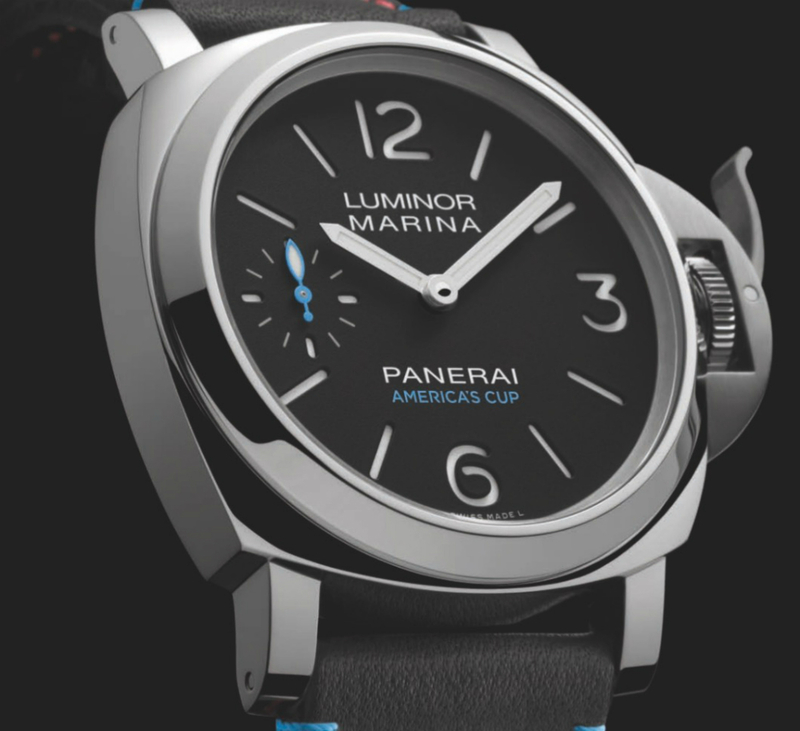 Panerai’s famous Luminor Submersible 1950, for example, utilizes a new material called Carbotech. The brand, a unique mix of Swiss precision and Italian design, promises to bring excitement to Watches&Wonders 2015. “We are presenting many inventions of a tactical nature. The focus is mainly on the Radiomir 1940 collection, with its sober ’40s-style design of exemplary simplicity, but we are also introducing more recent additions from our manufacture,” Bonati says. 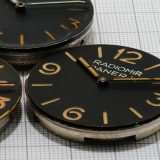 The Radiomir 1940 has been described as a “classic of modernity”, and also the brand salutes its own history in its own new layouts with the debut of the Luminor 1950 instance, distinguished by a unique crown-protecting device.Like all of Panerai versions, it melds form with function, eliminating superfluous decoration. Panerai is introducing two special editions of this 45mm watch, mixing it with all the P.2003/10 movement for the very first time within this skeletonised form to give date and GMT purposes, and a protracted power reserve, made possible by the three spring barrels. 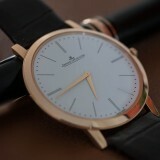 In addition to hours, minutes and small moments, the functions include the date and a linear sign of the power reserve. The local time is adjusted forward and backward in one-hour increments, automatically adjusting the date. The second time zone is indicated by a fundamental arrow hand, with the am/pm sign at 9 o’clock.